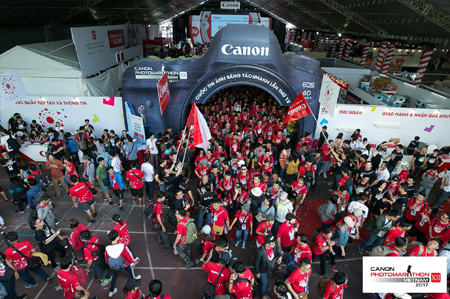 HCMC, 08 October 2017 – Canon this weekend will make Saigon its Studio as 7,000 residents of the nation’s largest city descend up district 1, cameras in hand, for the 12th annual Canon PhotoMarathon. Kicking off at District 1’s Hoa Lu Stadium on Sunday October 29, this is the second of 2017’s PhotoMarathons, following a Danang event three weeks ago, before Hanoi completes the year next weekend. 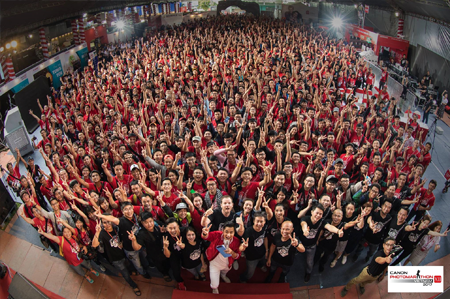 With a Canon-army of bright red-shirts a metaphor for Ho Chi Minh City’s morning heat, a 6 am start will propel the 7,000 contestants on to their city-wide photographic landscape as they race against the clock to collect creative images from their town. 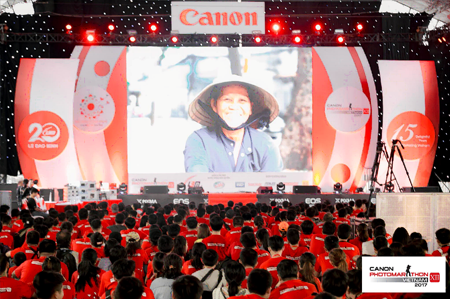 This year’s PhotoMarathon is also the finale to the imaging leader’s inaugural Canon Expo, a four day celebration of the company’s 15 th anniversary in Vietnam, 20th anniversary with local distributor Le Bao Minh, and 80th birthday worldwide. The contest retains the day-long format that has made it so popular in years past, keeping the topics of the assignments a closely guarded secret until the last minute, presenting a time-sensitive challenge that tests contestants creativity as they vie to submit attractive images ahead of tight deadlines. Judges for 2017 are famed photographers Hai Thanh and Hai Dong, who will also make themselves available for tips in street and portrait photography. Their practical guidance can be put into use just moments later as contestants take to the streets to see what they can capture. The day is capped off by an array of music stars, dancers and performers, bringing a festival feel to the event. The 2017 PhotoMarathon features two new categories for participants as Canon allows drones or flycams for the first time, and opens its contest up to online contestants for the first time. Allowing drones to enter means that contestants are able to use digital cameras of any brand or style other than mobile phones, while online entrants are kept up to date with the day’s themes via the Canon Vietnam fanpage before submitting their entries along with their names and contact details (phone/email) to canonvietnamtv@gmail.com within the allowed time and with “Canon PhotoMarathon online_Name of the assignment” in the subject line. Winners will be chosen by Canon and announced on the company’s Fanpage on 15 November 2017. Terms and conditions for the online contest can be viewed at www.canon.com.vn/PhotoMarathon. The contest is open to Vietnamese nationals and foreigners with valid legal residence in Vietnam. Winners will be determined by Canon and its panel of judges. All fees contributed to the competition will be transferred to “Vì thế hệ tương lai” (For future generations) fund to build schools for underprivileged students, ensuring photographers become a meaningful bridge to build a better life for communities here. 3 Consolation prizes: 1 kit of camera bag, photographer jacket, photography guidelines and Mobifone card worth 500.000 VND. In addition, the winner of the official contest in each city will represent Vietnam in the Canon PhotoMarathon Asia Championship in Japan to compete with 16 regional champions with the opportunity to win the awards of up to $5,000. The results of the Canon PhotoMarathon contest in Ho Chi Minh City will be updated in a press release later within the day of the event.